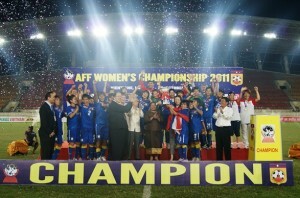 Thailand powered their way to the AFF Women’s Championship title for the first time when they edged a defiant Myanmar 2-1 in the final at the National Stadium here tonight. Despite the tight Myanmar defence throughout the final, the speedy Thai strikers managed to slip through the cracks twice but it proved enough to help them secure the crown. It was sweet success for the Thais who failed in two previous final appearances, in 2007 and again in 2009 when they lost out to Myanmar and Australia respectively. Tonight, in their third attempt, the Thais, who have been unbeaten here, prevailed to wrest the regional women’s title. For Thailand, SEA Games champions in 2007 and runners-up in 2009, tonight’s victory did not come easy as Myanmar put up a fight all the way to the end of the match. Thailand struck their goals in the first half through skipper Junpen Seesraum and Kanjana Sung-Ngoen. Thailand tried to increase the scoreline to put themselves in a comfortable position but Myanmar never let through again. And just when the game appeared to be all but over, Myanmar pulled one back through substitute Yee Yee Oo in the last minute. Despite the three minutes of added time, Myanmar were unable to hit the all-important equaliser and had to settle for the silver. With the likes of the skilful Nisa Romyen leading the attack, and well supported by speedy flankers, Kanjana on the right and Wilaiporn Boothduang on the left, the Thai strikeforce simply overwhelmed the Myanmar defence in the first half. It was some brilliant saves from goalkeeper May Khin Ya Min that kept the score down before the break. Despite their best efforts, Myanmar let in two goals. After numerous misses, Junpen broke through the middle and sent her low shot to the right in the 25th minute. The bench was jumping with joy for a second time in the 38th minute when Kanjana drilled in a powerful drive that hit the left post and turned in. Thailand continued to press on after the break but the Myanmar defence held their ground. While the Thais were busy plotting their way through, the Myanmar forwards managed to steal away on several occasions, however, they were unable to make their shots count. A goal in the early part of the second half could have changed the rhythm of the game, but Than Than Htwe and San San Maw both missed their chances in the 45th and 66th minutes. But in the dying minutes, Yee Yee Oo let loose a lovely curling shot into the top of the net, leaving the Thais stunned. And suddenly, Thailand, who were on the offensive for most of the match, fell back to defend the score. It must have been a long three minutes but the Thais kept their cool to raise the women’s trophy for the first time.